Who doesn’t love a refreshing, cold glass of lemonade on a hot day? It practically says “summer”. 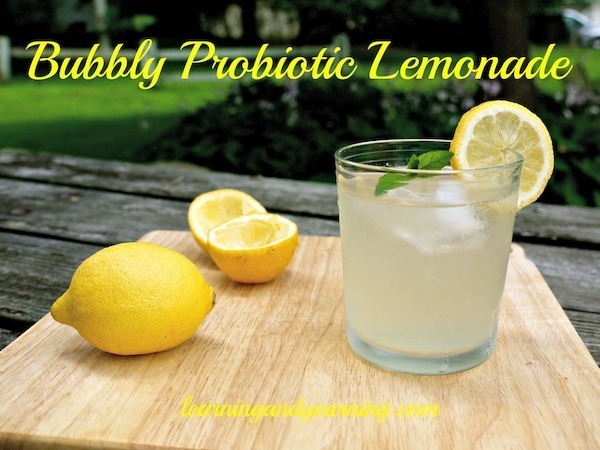 Ferment that lemonade and you’ve added an entire new dimension to it – probiotics and some fizz. We all know that probiotics support our digestive system and are beneficial in so many other ways. They also help to fight the detrimental effects of eating GMO foods when we just can’t avoid them. You may also replace the juice of lemons in this recipe with limes to make limeade, or oranges to make orangeade. This is based on the recipe in Nourishing Traditions for “Punch”. 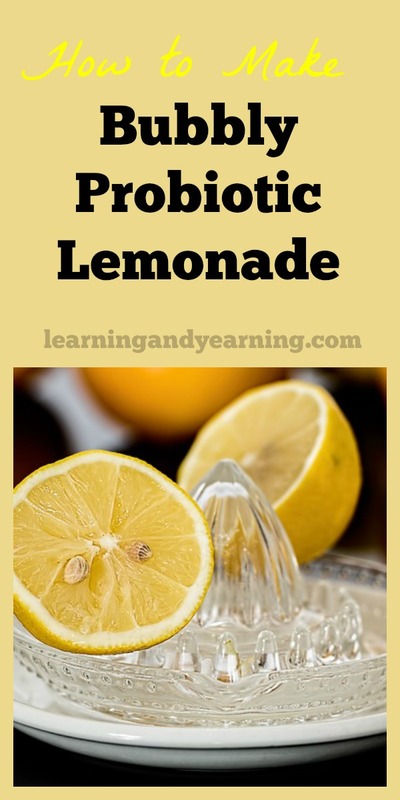 Ferment that lemonade and you’ve added an entire new dimension to it – probiotics and some fizz. Add the juice of 6 lemons, sugar, and whey to a half gallon Fido jar. Add a few cups of filtered water and stir until the sugar is dissolved. Add more water until the jar is filled to within an inch or two at the top. It’s important to leave some space in the jar. Close the jar and cover it with a dishtowel and leave on your countertop for two days to ferment. If you prefer a more tangy lemonade, you may leave the lemonade to ferment for a third day. The sugar feeds the good bacteria as it ferments and the beverage becomes less sweet each day that you allow it to ferment. We find that two days is just perfect. *Drained from plain yogurt, kefir, or leftover from cheese making. Hi Jacqueline – always a pleasure hearing from you! I don’t see why you couldn’t use honey, but I’ve never tried. Have you made kombucha w/honey? If that works, I think this would, too. I suggest starting with just a quart for your first batch, just to be sure. Oh, and I linked up this morning! Thank you so much for your kind words! I do know that raw honey is NOT effective when trying to cultivate things like water kefir because honey is a natural bacteria inhibitor (why it’s so good for colds and allergies). Don’t expect good results from using honey. I would recommend maybe leaving a few organic dates in the water for the sugar the culture needs. Won’t be as nearly as sweet though. Thank you for the great info, Patrick! I get wonderful results from using honey to ferment. Water + honey = Mead. It also works well when making fermented lemonade. I also use it quite successfully in second ferment of water kefir. I don’t use it during first ferment, because the bacteria naturally in the honey may change the bacterial makeup of the grains themselves. But, so could any raw foods (fruit or juices.) as all raw foods contain bacteria. Most sugar will be used up during the fermentation process. So it will break down and most of it will be digested. I think the reason why sugar is used for probiotic drinks and kombucha is because the honey has bacteria in it that can upset the balance between the yeast and the kombucha scoby. Like you mentioned in your post though, if allowed to ferment long enough, the yeast will eat the sugar so you aren’t, if that makes sense. Great post. 🙂 We’ve been enjoying water kefir soda this summer. That makes sense, Jenny. Thanks for the info!!! Honey isn’t the best choice; it doesn’t have bacteria in it since it’s actually anti-bacterial. Using it as a sweetener may kill the bacteria in the whey. I’ve heard it suggested that you could try using half honey and half sugar, but I’m still not sure that it would work. The sugar gets eaten by the bacteria, so you may just want to wait until the lemonade has fermented to the point of being no longer sweet, and then adding honey to individual servings to sweeten. Thank you for the helpful info!!! Honey does indeed have bacteria, if raw, and will ferment just fine! It’s where we get Mead, after all. I use it to ferment, and it’s great. Honey is used for wound care, which is where I suppose the antibacterial claims must be coming from, but that is when used in its undiluted state. Once diluted, it WILL ferment. And it works well for making fermented lemonade, too! I have never read about Fermented drinks! Thanks for sharing the recipe at the HomeAcre Hop. Hope to see you again on Thursday! When I originally commented We clicked the actual -Notify me while new comments are added- checkbox and now when a comment can be added I get four email messages with the same review. Is there in whatever way you can eliminate me from that support? Thanks! I apologize; I’m not able to do that. Is there anything at the bottom of the email that would allow you to change your setting? I am working hard to get off of the diet drinks and Mcdonalds Sweet Tea – I know. I know. It is terrible. I love try this recipe out and let you know how it works. I really want you to succeed!!!! I can’t wait to hear back from you to see if you like the lemonade. I love that there are only 4 ingredients, and super easy to make. I think you’ll love it!!! I featured your post today on the HomeAcre Hop – stop by to check it out! We’ve been drinking fermented sodas all late spring and summer and love them. I tried a fermented ginger/lemon soda too but this sounds good with the whey…I also love how simple the recipe is. I’ve pinned this for later…thanks for sharing! can I use the whey from draining kefir? I know you said not to use whey from cheese making but thought maybe kefir would be different. Thanks, I would love to try it. My husband loves lemonade. Yes, Claudia, you may definitely use whey from kefir in this recipe. Enjoy! Hi Christina, Yes, a Mason jar would work fine. I checked with some cheese making friends and they DO use the leftover whey in their ferments. So sorry for the mistake. Hi!!! Thank you for the recipe and info! 🙂 I have a question about the why. My husband and I are lactose intolerant, and we avoid dairy to a certain degree (though we still eat cheese and kefir). Would the whey in this recipe cause problems? My issue typically is that daily is constipating, and I know that anything fermented/probiotic related helps the gut and regularity. Thanks! Hi Shannon, the whey I use is actually strained from kefir, so if you can tolerate kefir, you should be fine with the whey from it. (I’m not a nutritionist, though, so I can’t make dietary claims). Thanks for the recipe. I’m making the lemonade, and one day in, the liquids have separated, the top is very clear and the bottom is quite cloudy. Do I need to be stirring the liquid or do I just leave it alone? Hello Susan, the recipe sounds very easy to make. I’m not very fond of lemonade but love coconuts, berries, peaches, etc. I saw a coconut kombucha bottled drink in my local health food store, at $10 for a 500ml bottle. Outrageous price!! I’d love to use my whey from yogurt to make a coconut drink. Can you suggest a formula for me to try? Perhaps e.g. 1 cup coconut milk, 1/4 cup organic cane sugar, and water to fill the half gallon glass jar? Thank you so much Susan. I thoroughly enjoy your blog and the countless ideas and recipes that you share with your subscribers. Thanks, Elizabeth! I don’t have any personal experience in making a fermented coconut milk drink. I did find this recipe for coconut milk yogurt that would be probiotic: http://www.smallfootprintfamily.com/2009/04/25/homemade-coconut-milk-yogurt/ and this one for coconut water kefir, which is a beverage. Hope that helps! Can the whey used be from water kefir? Or only a milk product? New to this, and all I’ve mastered so far is water kefir. Hi Patty, I’m afraid that whey only comes from milk products. If you strain some yogurt through cheesecloth, the liquid part is whey. That’s probably the easiest way to make whey. Make sure the yogurt is plain and that it’s a good quality yogurt that contains probiotics. Sadly, not all yogurt on the market actually contains good bacteria. Can I use frozen whey? I have plenty in the freezer, both from making cheese as well as from making yogurt. Freezing the whey should not affect the probiotics in it, so I assume so. I don’t have personal experience, however. I have made this before. It turns out as a tart lemon drink. Not sweet at all. The only difference in my recipe then the one here is to add 1/2 tsp. nutmeg and use 2 quarts of water. you also must use glass. As plastic will leach when you are fermenting. And the recipe from the Nourishing Traditions cook book and the healthyhomeeconomist.com (called Hindu lemonade) says to use a tight lid during and after the ferment. Like water kefir. You can also use limes or half limes half lemons! Hi Melissa, thanks for visiting. what about replenishing it? do you just drink it all & start over? With kefir you save some & make another batch.. I just started my batch this morning! Hi Paul, I think that theoretically you would be able to just use some of the lemonade to make the next batch. The problem that I have found is that by the time I’m ready to make a new batch, the “old” lemonade is pretty tart and that flavor seems to permeate the new batch. I prefer using whey each time. If I made lemonade every 3 days, I think it would be fine, but for me it’s more like every two weeks. Susan, thanks! I will have to see how it goes. I just drank my first glass this morning! The good news is, the whey comes from the yogurt, and the leftovers from that create Yochee, which makes some delicious chocolate mousse that we love!! Yay for you, Paul!!! I just talked to the chapter leader of our local Weston A. Price Foundation about this. She does lots of fermenting. She said that she always uses whey; she thinks, though, that the culture would weaken with each successive ferment if you try using the lemonade instead of whey. Hope that helps. Lol i came across this post while drinking some fermented lemonade, and unfortunately. or soranges(a fruit that basically looks and tastes like an orange and a lime combined) . also a good combination susan if you don’t already have it is guavas with a hint of lime juice; Allow that to ferment and you got yourself some liquid gold. This sounds good to me. My question is can bottled real lemon juice be used? I don’t use reconstituted lemon juice, I buy the pure 100% lemon juice from Whole Foods grocery store and it doesn’t last long because we use it daily in water. I’ll have to figure out how much to use equal to six lemons(I think it could be almost two tbsps for a medium large lemon). If you don’t think this will work then I’ll use the six lemons. Thank you. Hi Sondra, I don’t have any experience using bottled lemon juice, but I’m inclined to say yes, since it’s the whey that does the work of multiplying and creating probiotics. So this is my first batch and I think it’s done, but how do I know I did it right and that it is safe? Everyone is scared to try. Is there any smell or characteristics I should be looking for and what is the purpose of a tight lid? The tight lid is to keep air out and to keep the gases in. Take a small sip; you will know if it’s bad. A week should not be a problem – if you don’t drink all before then! Hi Linda, all is well; there is no need to stir until you are ready to drink it. I know when making fermented veggies I just add raw salt and skip the whey. I bet you could do that with this recipe too. Gonna try it! I was wondering if Coconut Sugar would be OK to use. I haven’t tried coconut sugar in this, but I would think it would work just fine; it would give you a darker color lemonade. I am from Kerala , Southern tip of India. I have limes in my garden. They do not need any pesticides and we fertilise the soil with cow, goat and chicken manure. I shall try this recipe with lime,. Do you know how many limes equal a lemon? We do have coconut trees also. Coconut water which is the transparent sweet fluid that comes out when you break open a coconut, is a rich source of glucose. If sugar is added to it and it is kept in a warm place, it ferments to something like toddy. My mom used it to ferment flour in place of yeast. Whey is given to lactose intolerant babies and so it ought to be safe for lactose intolerant adults as well. Welcome! How blessed you are to have such wonderful trees in your garden. I think that a lemon generally has 2 – 3 Tablespoons of juice and a lime around 2 Tablespoons. So I would probably use 8 – 9 limes for the recipe. Hi Pam, the whey strained from yogurt, kefir, or from cheese making is not dairy free. Do you ferment vegetables? I have used the dairy-free brine from fermentation to make this as well. I do prefer the whey, but the brine worked as well. Hi RaZella! The raw sugar should be fine. You may want to leave it on the counter another day. Then a few days in the frig should do the trick. I have tackled and mastered homemade kombucha, and now must take on water kefir, kefir soda. This recipe is really simple and looks delicious. Can’t wait to try it. Thanks for your recipe. I only had a 3 litre Fido jar so I added a couple of small lemons to the recipes six and a bit more sugar (organic panela) and 3/4 cup ginger bug instead of the whey as I didn’t have any kefir or yogurt on hand. Filled up with rainwater. I’ll find out in a couple of days to see if it works. Hey, I tried this recipe and it has been 3 days and no fizz. I did use bottled lemon juice, but in light of the fact that it was 100% pure organic lemon juice with no preservatives, it doesn’t seem like it would matter. If I can be sure it was the lemon juice I would try it over again with fresh squeezed juice, but I’d like to know what’s going wrong with my system. Any ideas? It’s very hard to say why your ferment didn’t get fizzy but no fizziness doesn’t mean that it is bad. Have you tasted it? Is it good? I don’t think that the bottled lemon juice would cause a problem. Temperature can affect a ferment. Be certain the water you use does not contain chlorine, and be sure the jar you use is spotlessly clean. Did you make whey by straining yogurt? What yogurt? Are you certain that it was a brand with live bacteria? All of these factors can affect your ferment. I’ve had ferments that were not particularly fizzy but after refrigerating for a few days, the fizziness increased. Hi Susan, thanks for your prompt response. It tastes fine, like a homemade lemonade I guess, though without carbonation. I strained whey from the organic Stoney Field brand yogurt. What kind of yogurt do you use? I used distilled water from the store instead of the chlorinated water from the tap for the recipe, however, traces of chlorinated water could have been present from the washing and such. Does it help to just give it more time? I could leave it on the counter or in the fridge and see what happens. Whatever happens, this is a neat project and one worth learning! Thanks again for helping ! I make homemade yogurt, but Stoneyfield should be just fine. And honestly, I don’t think that washing your jar in chlorinated water would affect the ferment. Why don’t you give it another day at room temperature and then refrigerate it for a day. Does 1 C mean 1 american cup in amount? Yes, that is 1 cup. I apologize for not being more clear. Any substitutes for whey? We don’t do dairy or dairy by-products, would a vegan protein powder work? What makes the whey important to the process? Thanks for any help you can offer. Hi C, the whey is important to the process because it contains the probiotics that will start the process of fermentation. Vegan protein powder will not work. You may want to try a different type of fermentation. While this one is based on beneficial bacteria, you can ferment with beneficial wild yeasts. Using the same process I used in this pine needle / raspberry fermented soda should work: https://learningandyearning.com/pine-needle-and-raspberry-soda/. Can I use the juice from a jar of Bubbies sauerkraut? Mary, so technically, yes. I tried it with the juice from my homemade sauerkraut and it did ferment, but I sure didn’t enjoy the taste. It just wasn’t lemonade. I love this! It looks so delicious. I think this is a probiotic drink I could definitely get my kids to try. I really want to try and incorporate more probiotic foods into their diets and I was struggling to find an avenue to do that. Thank you for sharing!